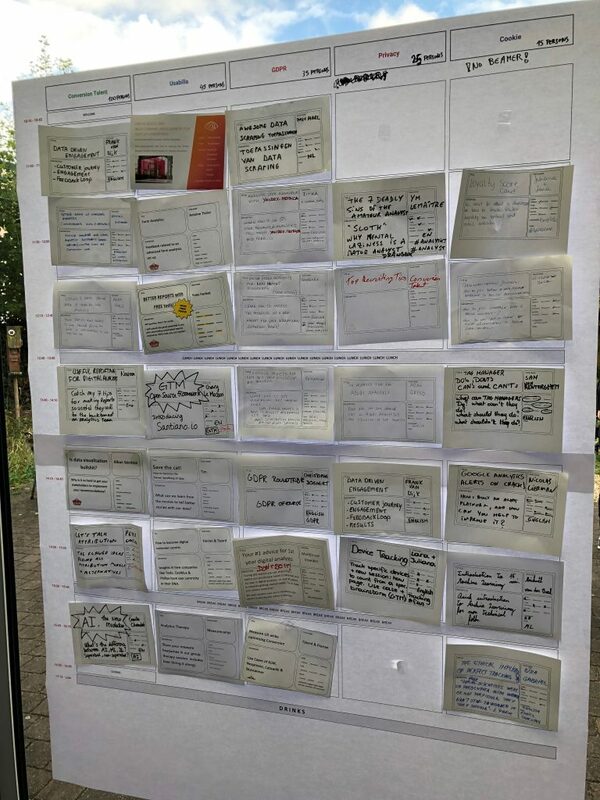 Home &gg; Blog &gg; Featured, General &gg; My First MeasureCamp! Last Saturday, I attended my first MeasureCamp! It was the inaugural MeasureCamp for Brussels and it had about 150 people there and those people came from as far away as Russia to attend! About 40% of the attendees where not local, but being in central Europe, it was easy for people to come from France, UK, Germany, etc. (I was the lone American there). Over the years, I have heard great things about MeasureCamp (and not just from Peter! ), but due to scheduling conflicts and relatively few having taken place in the US, had not had an opportunity to attend. Now that I have, I can see what all of the fuss is about. It was a great event! While giving up a Saturday to do more “work” may not be for everyone, those who attended were super-excited to be there! Everyone I met was eager to learn and have fun! Unlike traditional conferences, MeasureCamp, being an “un-conference,” has a format where anyone can present whatever they want. That means you don’t just hear from the same “experts” who attend the same conferences each year (like me!). I was excited to see what topics were top of mind for the attendees and debated whether I wanted to present anything at all for my first go-round. 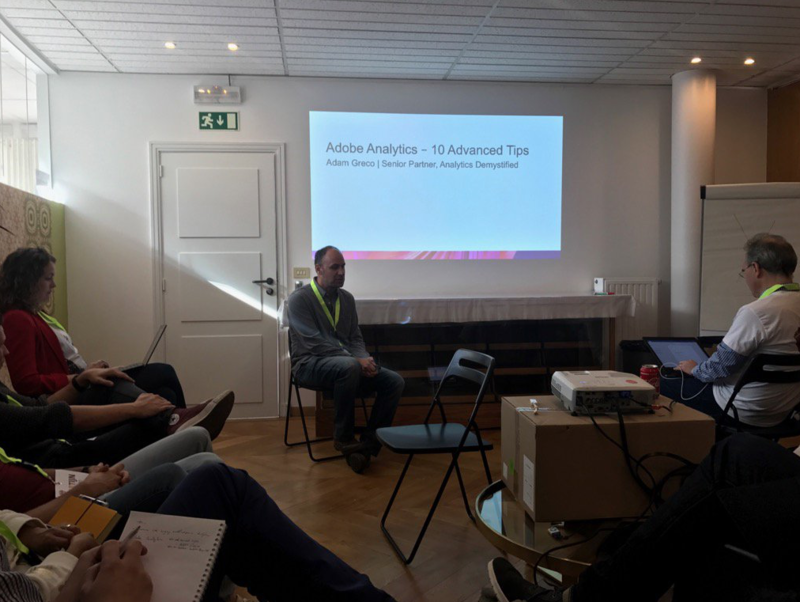 But as I saw the sessions hit the board, I saw that there were some slots open, so at the last minute, I decided to do a “lessons learned” session and a small “advanced Adobe Analytics tricks” session. 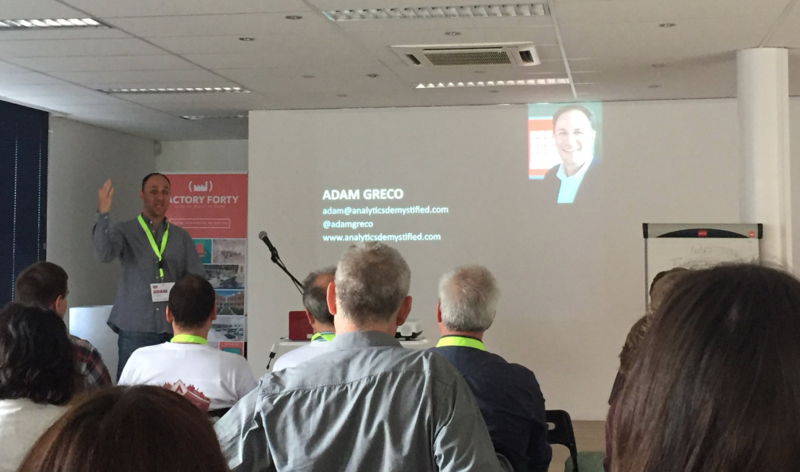 I attended sessions on GDPR, AI, visitor engagement, attribution and a host of other topics. Overall, it was great to meet some new analytics folks and to hear different perspectives on things. I love that MeasureCamp is free and has no selling aspects to it. While there are sponsors, they did a great job of helping make the event happen, while not pitching their products. Think about what you might want to present ahead of time and consider filling out the session forms ahead of time if you want to make sure you get on the board. Some folks even made pretty formatting to “market” their sessions! Be prepared to be an active participant vs. simply sitting in and listening. The best sessions I attended were the ones that had the largest number of active speakers. Bring business cards, as there may be folks you want to continue conversations with! I am glad that Peter has built such a great self-sustaining movement and I look forward to seeing it more in the US in the future. I recommend that if you have a chance to attend a MeasureCamp, that you go for it!